So much space in this 3-4 bedroom 2 1/2 bath grand home that sits proudly on a high and dry lot! Stunning estate of over 2 acres that is the envy of the neighborhood when the gardens come alive with their vibrant colors. This Contemporary style home has so much to offer and includes master w/bath and walk-in closet, large open concept kitchen/dining area with island, front porch, office, bonus room on third floor and spacious dry basement. Make yourself the proud owner of this stunning, spacious and well appointed 4 bedroom 2 1/2 bath Colonial home! Enjoy the many amenities such as gleaming wood and tile floors, living room w/pellet stove, kitchen with granite topped island, formal dining room, large L-shaped deck, front porch, huge master w/bath and 3 car attached garage all set on over 8 acres at the end of a cul-de-sac! Get ready to fall in love! This 4 bedroom 2 1/2 bath Cape style home is set in a very private location on 15 gorgeous acres! The many amenities include a great room with vaulted ceiling and wood stove, formal dining room, formal living room, master bedroom on first floor with full bath, first floor laundry, storage, new rear deck, apple trees, year round pond and a 30x32 attached 2 car garage! Showings will begin at the Open House on Sunday, April 22, 2018 from 2-4 pm. Come home to an oasis in the woods to relax and enjoy this beautiful 3 bedroom 2 1/2 bath Colonial! Surrounded by 3 acres of nature this property boasts many amenities such as gleaming wood floors, kitchen that opens to dining area w/woodstove, front to back living room with access to deck, patio with natural stone fire pit, first floor laundry, 3 car attached garage with workshop and "mudroom" area, spacious master suite w/bath and walk-in closet. Live here and enjoy harvesting blueberries in your own backyard in the summer! Very private location and West Bath School for grades K-5! If you've been dreaming of a home in the country with the option of having a "mini-farm", then don't let this beauty pass you by! This Raised Ranch stands tall with its addition above a 2 car garage that serves as a wonderful cozy living area complete with vaulted ceiling and Yotul wood stove! Within the borders of its 3.8 acre parcel lie crops of grapes, strawberries and vegetables, a chicken coop, fenced areas and detached garage/barn! Are you looking for complete privacy in a country setting? Spacious well built house? Huge 2 story 36x44 garage with a 16 1/2 foot ceiling? Then come look at this beauty! This 3 bedroom 2 bath home is located on a 3.7 acre lot. What a great opportunity at a great time! Own a beautifully renovated building that serves as a restaurant with an income producing large 3 bedroom apartment above. All equipment included to run a state of the art restaurant. This building was carefully and completely reconstructed in 2008. 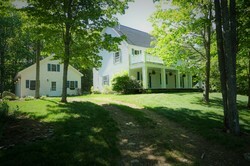 Adorable Cape in the woods on over 4 acres surrounded by another 500 acres of gorgeous preservation land! Lovely and private, this desirable property includes a 2 car attached garage with space above, attached den with wood stove and vaulted/beamed ceiling, Mahogany flooring, standby propane generator, out buildings and fabulous walking trail easily accessible from yard. Stunning 3 bedroom 2 1/2 bath Contemporary home in an idyllic spot on 8.4 acres of privacy! Become the proud owner of this property and enjoy the front porch, tiled entry, huge front to back living room with hardwood flooring and pellet stove, kitchen w/island and pantry, master bedroom with bath and walk-in closet, fenced yard, patio and 2 car attached garage! No showings until Sunday, October 1st from 2-4 pm. Stunning 2009 Contemporary with one floor living in lovely location on a 3.3 acre lot! Make this your home and enjoy the front porch, living room with vaulted ceiling and Jotul gas fireplace, central vacuum, master bedroom with bath and sitting room, laundry room and attached 2 car garage. Includes beautiful gardens and landscaping! Open House on Saturday, September 16th from 1-3 pm. Have you been thinking and/or looking for a way of life that includes growing your own food and raising a few farm animals? To be self sufficient? To have complete privacy in an oasis of nature? Come check out this quality built Raised Ranch on a gorgeous 7.06 acre lot with several out buildings, greenhouse, 3 car built-in garage, fireplace, wood floors, decks, stone walls, wood stove and generator hook-up. No showings until Saturday, July 29th from 1-3 pm. Come home to this well appointed open and airy Contemporary! Enjoy its newly remodeled kitchen and baths, great location near the Topsham Fair Mall and I-295 and the many other amenities it has to offer. Includes 2 car garage, laundry room, den, gorgeous yard and large paved driveway! Within the Woodside Elementary and Mt. Ararat school district! No showings until the May 7th Open House from 2-4 pm.